Reflections on hoarding, evolution, and Fallout: New Vegas | Motivate. Play. 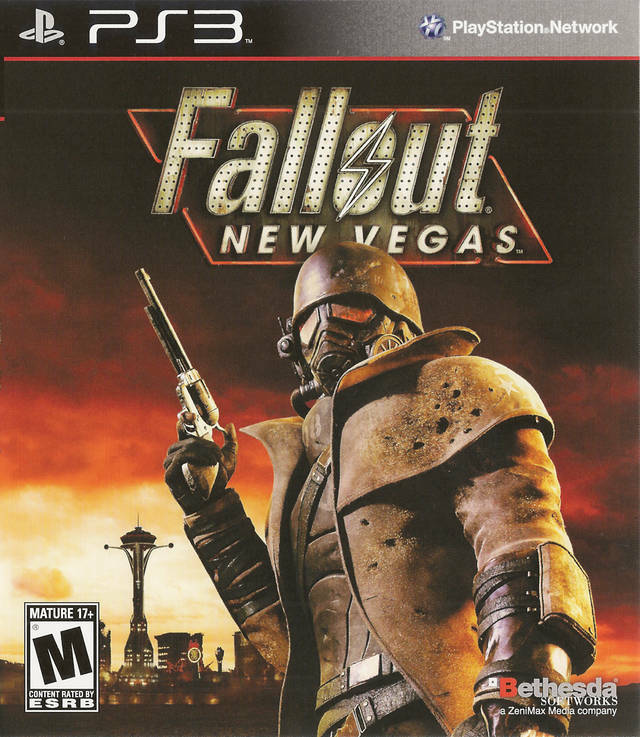 So my latest gaming obsession is Fallout: New Vegas, the latest action RPG release from Obsidian and Bethesda. And I don't use the word "obsession" lightly (okay, maybe a little, but still). When I heard last year that there was a new Fallout game being released, I sensed the danger. I knew how easily Fallout 3 had consumed my time, and so I resisted the urge to buy it when it was released in October. And given how busy I was with school, and having heard many reports that the game was riddled with some pretty serious bugs, I felt satisfied with my decision. Months of relative productivity were to follow, until the fateful day a few weeks ago when I stepped inside my local Gamestop, "just to look around". Yeah, right. There on the shelf was Fallout: New Vegas, for only $20! "Wow," I thought to myself, "that's only a third of what a new game costs. Who cares if it has a few bugs?" And so, with assurances from the clerk that a recent patch had resolved many of the bugs, I paid the man and triumphantly proceeded home. I had loved Fallout 3, after all - what was there to lose? Well, a few weeks and more than 52 gameplay hours later, I can tell you precisely what I've lost. The first thing should be obvious - my time (I look at my summer reading list and realize that half of the time I've spent on Fallout would have gotten me most of the way through it). The second is a bit less concrete, but I think I could best describe it as a loss of freedom. That is, an inability to play the game on my own terms. Perhaps I'm contradicting the stance I took in my earlier post on Zynga games, but I find myself compelled to play, to complete every quest, discover every location, and to amass as many items, weapons, and so on as possible. This isn't to say that the game isn't fun; despite its technical faults and some other, less egregious, failings, it has a whole lot going for it (tons of locations to explore, fun side quests with interesting characters, and great visual design, to name a few). But I'm not writing a review here (Gamespot has a decent one that I generally agree with), and instead want to focus on my disconcertingly compulsive gameplay habits, or, more concretely, what it is about this game that brings them out in me. I suppose that revealing this failing of self-control on the internet for all to read may not be the best move on my part, but let's write it off as research, okay? I'm nowhere close to believing I have a Fallout addiction, but a sign that something is amiss occurred to me the first time I found myself playing the game well after it had ceased to be fun. I'd been at it for an hour or two - nothing crazy - and for whatever reason didn't feel like playing anymore. I wasn't enjoying myself in the way I normally do when playing a game, and was perfectly capable of saving my progress and shutting it off, but was struck by a need to continue. Consciously I wasn't getting much of anything out of the experience, but still, I had to play. Is this what it feels like to be a Farmville player? Now, my typical response to people who criticize gamers for "wasting" their time on videogames is that it's not a waste of time at all, and my position roughly lines up more or less with Jane McGonigal's analysis of what makes games fun. But in this particular case I find myself hesitating to take that stance. Some time back Travis asked if games might be abusing evolutionary psychology, and I was inclined to respond: Of course they are, but who cares? Most anything we find fun has (at least in part) an evolutionary psychology account, so as long it's enjoyable, what's the big deal? Well, from where I stand now I can say without trepidation that it becomes a big deal as soon as a game compels us to keep playing at no benefit to ourselves (that is to say, lacking any sort of real hedonic 'kick'). For fear of sounding over-dramatic, let me be clear here: The vast majority of the time I'm playing, I am enjoying myself. This feeling of compulsion in the absence of conscious enjoyment is rare, but that fact that I've experienced it all makes the case for looking at things a bit more deeply. So what's going on here? This is clearly a big, complicated mess to offer an account for, and I have neither the time nor inclination to get at everything here. Being a single-player game, though, we can at least downplay the social element. I wouldn't eliminate it, though - just because I'm not using my collection of laser rifles in Fallout to attract a mate doesn't mean that my motivation for doing so isn't linked to an evolved inclination to accumulate "riches" for social ends. What I do notice in my in-game behavior is something akin to hoarding behavior, popularized, if not encouraged, by television shows like Hoarding: Buried Alive on The Learning Channel (the ease with which I dissociate myself from my gaming behavior is interesting in itself, but not a topic I'm ready to tackle at the moment). I collect weapons, ammunition, caps (the currency of the Fallout world), and other goodies with abandon, despite often lacking any real need for them. I currently have, for example, over 70,000 caps (that's an obscene amount, trust me) that I have no particular desire or need to spend. And while completing side quests and discovering the many hidden locations in the game world are qualitatively different pursuits, the underlying motivation seems to be quite similar. Once I started thinking about all this in terms of hoarding, I decided to poke around the literature on the topic a bit. There of course is nothing strange about a certain level of collecting behavior in humans (be it of food, refrigerator magnets, or whatever but abnormal collecting or "hoarding" is a serious disorder that can sometimes do real social, mental, or even physical damage. Hoarding is related to obsessive compulsive disorder, and seems to be a case of an adaptive evolved behavior gone haywire. In this paper Anderson, Damasio, and Damasio describe collecting behavior, from an evolutionary perspective, as a "behavioural predisposition to acquire caches of food and other potentially useful objects (e.g. tool making supplies) [that] was possibly selected for in evolution because it increased the probability of survival of the individuals who accumulated such caches prior to times of scarcity." It would seem that hoarding results when this behavioral disposition turns into an compulsion for someone with a disorder like OCD. The authors go on to say that "with the possible exception of food items, it is unlikely that the targets of acquisition behaviour (i.e. the objects to be collected) are specified at a genomic level. Rather, the individual learning histories and object availability appear to be critical determinants of the objects to be collected." So, in other words, what we end up collecting or hoarding varies as a function of what we've learned to value and what's available to be collected. From a gaming perspective, it's fairly clear that the game environment can structure players' "learning histories", and the available collectable objects (at least within the so-called "magic circle"). The real question of interest, however, is if the game can somehow encourage an otherwise normal (or, at least, non-compulsive) individual into a hoarder within the context of the virtual world. In my case, at least, the answer seems to be yes, but of course my experience is purely anecdotal, so this is a direction in which we need more empirical study. If this is in fact a generalizable phenomena, the next question is one of mechanism. How is that non-hoarders can be hoarders within the game? My first thought is to say that the possible negative consequences (in terms of time, health, lack of space, etc.) usually do not exist in the game world. I can spend as much time as I want scrounging for loot and caps in Fallout without running out of space to store it or affecting my ability to complete the game's main storyline. The problem, of course, is that the negative effects of such hoarding, while absent in the virtual world, spill over in to the real world in the form of lost time. Thus, what may be at play here (among other things, of course) is the lack of correspondence between the real and virtual worlds. The costs exist in real life, but the benefits are limited to the game. This is of course mainly speculation, but I'm curious to hear your thoughts. I know I'm leaving a lot out this discussion, but I wonder how these phenomena might bear on the experience of the Pokemon collectors and completion freaks that we all know. Think about it, and in the meantime, I have about ten active quests in Fallout that I'm neglecting. Reflections on hoarding, evolution, and Fallout: New Vegas by Jared Lorince, unless otherwise expressly stated, is licensed under a Creative Commons Attribution-ShareAlike 3.0 Unported License. I find this particularly interesting because I've recently been thinking about the Facebook games called Packrat. As the name indicates it's basically a collection game with the social twist. You steal cards and buy cards with the ultimate end of collecting a "collection" of cards of the same kind. It's fascinating to me because while it has the social component, points, and levels it's basically a neverending game with no real win except the satisfaction of collecting things. And what's even more fascinating is that people will pay actual physical money to further their progress. So they are wasting time AND money. There is definitely something being triggered that causes a "normal" person to just want to keep collecting things. Maybe it satisfies some subconcious need we are missing from our lives? I have a few additions to make to the research that you summarized above. There are a handful of growing studies on the nature of hoarding and the quality of the items acquired. For example, Mataix-Cols, Pertusa, Tolin, Frost and others have a series of recent publications showing that only a small subset of hoarders actually have OCD, but most have some generalized anxiety disorder and other cobmorbid problems (social anxiety, depression). There is also a different "quality" to the OCD and non-OCD hoarding, such as keeping things out of superstitious fears of breaking up sets in the former case only. In addition, in our own research we find that the people who have problems with hoarding do not actually favor items that would make for good "stockpiles" (like the evolved forms of storing food, emergency goods, money etc)--rather, they prefer items that have intermediate utility or social value. The evidence is mounting that at least part of the goal is to seek status, security, and emotional attachment benefits through the goods, to compensate for their typical unusual levels of fear, isolation, and social anxiety. Of course, I would never propose that someone's gaming or hoarding tendencies reflect loneliness or displaced anxiety (though see recent studies on this in JCR). I personally do not even have solid data showing this (but look for forthcoming work on this...). But gaming is a solitary activity, that still involves interacting with other people (real or fake) and you can gain status within this world (and in the real one) by accumulating the gamer goods and points and knowledge. Thus, this virtual exercise provides almost the same benefits of both conspicuous and utilitarian consumption as nonvirtual experiences--especially since your skill in this domain can be spotlighted to real people who also value this activity. The only down side is that you cannot actually ward off intruders with weapons you collect virtually (but it sounds like you have this taken care of, anyway).